This is the epitome of the multi-brand loyalty/rewards program, spanning venues in the restaurant, hospitality, entertainment and gaming categories. Landry’s Select Club features a value proposition that is integrated with all brands, allowing consumers to enjoy the benefits in many locations around the United Stated. For more information, visit the Landry’s Select Website. MYPANERA IS ABOUT SHOWING OUR APPRECIATION AND REWARDING YOU IN UNEXPECTED AND SURPRISING WAYS. Enjoying the surprises we’ve sent your way so far? We have lots more planned, and we think you’ll love what’s in store. From complimentary items in the bakery-cafe to exclusive tastings and demonstrations, MyPanera is always thinking of unique ways to thank you. The more you visit, the more surprises you can get (just when you least expect them)! Panera Bread Company emphasizes the strategic importance of their rewards program and the data derived from the program. The data is of strategic advantage in understanding guest behavior and using targeted and relevant communication and promotion to drive incremental revenue. Restaurant companies participating in the loyalty/rewards space or contemplating an entry into that space would be wise to study the strategic role of a loyalty/rewards program as an integral and potentially central element in their overall marketing mix. For more information on MyPanera Rewards, visit the MyPanera Rewards website. LevelUp is the free app that enables you to pay with your phone when you place an order at certain restaurants. Here’s an example of LevelUp and a restaurant adding value by creating a promotional offer that contains a rewards component. Use LevelUp at Café de Boston and you’ll get 10% cash back when you spend $100. New customers receive $2 for your first time visit to Café de Boston. Cafe De Boston is an all-purpose cafeteria for the “die hahhd” professional in Boston. When your feathers are ruffled from an episode of downtown parking wars, we’ve got two words for you: oatmeal bar. Served with fresh toppings like fruit, granola and almonds, the stuff is known to cure even the most severe cases of commute rage. When you’ve got 5 minutes to turn an afternoon meeting into a birthday celebration, Cafe De Boston also has your back with beautifully decorated cakes to make you look like the golden co-worker. And when the wind whips through the financial district and you need something to make you feel whole again, hit the build-a-bowl pasta station. With Cafe De Boston in their arsenal, the tie and pencil skirt crowd is bound to conquer! Click here to access the Cafe de Boston LevelUp page. Click here to learn more about LevelUp and here to access Cafe de Boston’s website. 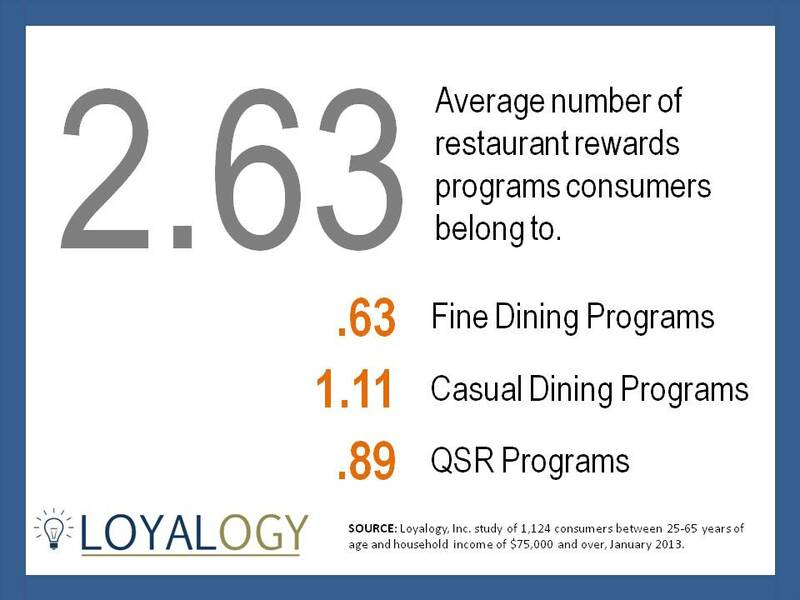 Asheville, NC, January 15, 2013 – Loyalogy, provider of loyalty program consulting and analysis services to the restaurant industry, announced the results of its first annual LoyaltyPulse U.S. study tracking consumer attitudes and behavior regarding restaurant rewards programs. [Click here to view and/or download the study]. 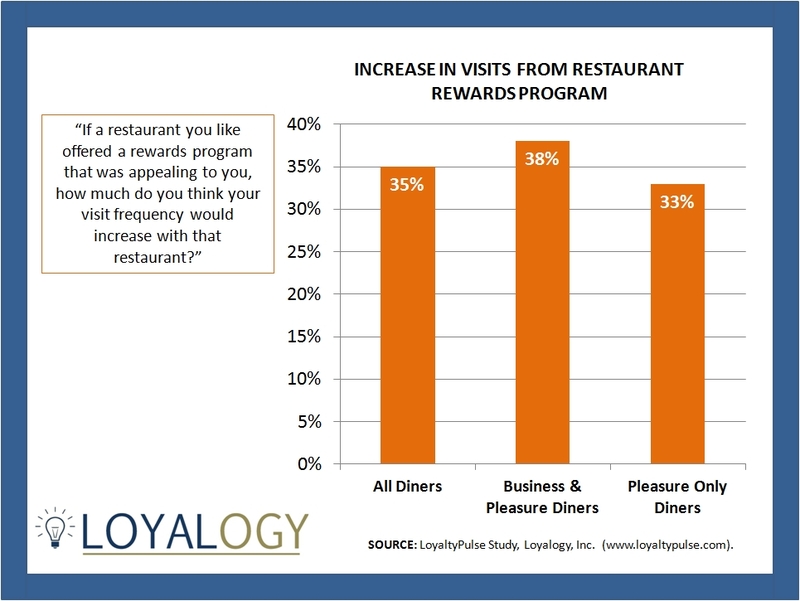 “The LoyaltyPulse study provides clear evidence directly from consumers regarding the effectiveness of restaurant rewards programs and the value associated with using the rewards program data to tailor and target guest e-mail communication,” said Dennis Duffy, President of Loyalogy. Consumers estimate a restaurant rewards programs would increase their visit rate to a particular restaurant by an average of 35%. Nearly two-thirds of consumers (65%) report they would recommend a restaurant more to others if that restaurant offered an appealing rewards program. Four out of five consumers prefer a rewards program with a clearly-defined proposition in which they earn points for rewards than a program built solely on periodic, surprise free items. While only 10% of respondents have paid a fee to join a restaurant rewards program, fully 50% state they would be willing to do so if the program offered adequate value. Relative appeal of 15 different reward program benefits. Attitudes about 12 different statements regarding carrying membership cards, using a phone number as identifier and receiving promotional e-mail messages from rewards programs. Likely visit rate changes based upon different levels of rewards. Whether or not consumers have paid an enrollment fee to join a restaurant rewards program and what would motivate the payment of an enrollment fee. For more information about the LoyaltyPulse study, visit www.loyaltypulse.com. Founded by Dennis Duffy, with more than twenty years of experience developing, managing and analyzing customer loyalty programs, Loyalogy provides loyalty program development, consulting, project management and database analysis services to restaurant companies. For more information, visit www.loyalogy.com. Dennis Duffy – President, Loyalogy, Inc. at 828-333-5860 or dennis@loyalogy.com. Click here to download a PDF of the LoyaltyPulse Study.